Dortmund - Borussia Dortmund thrashed Hamburger SV 6-2 to record their fifth straight league victory, their best ever start to a Bundesliga campaign. Pierre-Emerick Aubameyang opened the scoring for the hosts, before Henrikh Mkhitaryan doubled BVB’s lead. Zhi Gin Lam pulled a goal back for Hamburg with a spectacular goal from the edge of the penalty area and the visitors even pulled level before a flurry of second half goals ensured the points stayed in the Signal Iduna Park. The Yellow-Blacks started brightly and broke the deadlock after 19 minutes. 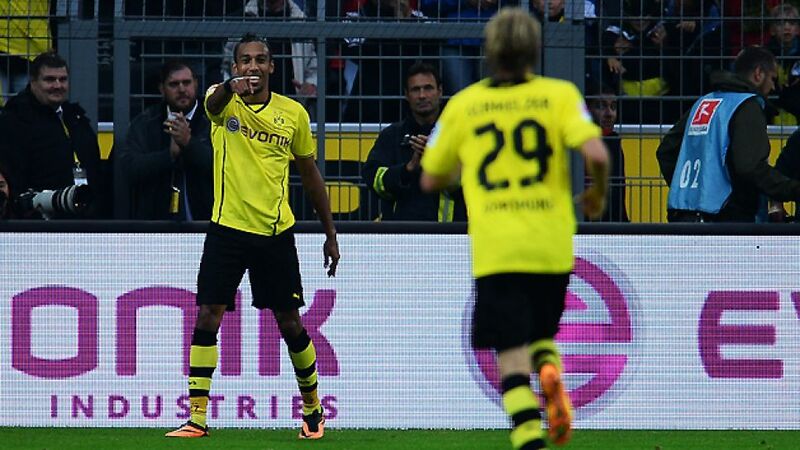 Marcel Schmelzer’s quick free-kick found Aubameyang, whose pace took him past Heiko Westermann with ease. Adler managed to get a hand to the Gabon international’s shot, but was unable to stop the ball going in off the underside of the bar. It didn’t take Jürgen Klopp’s side long to double their advantage. Reus played the ball into Lewandowski, whose clever back-heel sent Mkhitaryan clean through on goal. The Armenian playmaker had plenty of time to pick his spot, finding the net via the inside of the post to put BVB further ahead with his third goal in two games for the club. The visitors hadn’t produced much of an attacking threat up to that point, but Thorsten Fink’s side reduced the deficit in spectacular fashion just minutes after Dortmund’s second. Lam picked the ball up on the left, evaded Neven Subotic’s challenge and unleashed an unstoppable shot into the bottom right-hand corner from 25 yards. The hosts could have restored their two-goal advantage before the break, but Adler produced another smart stop to deny Reus. Dortmund started the second period in similar fashion to the first, with Aubameyang again going close, but it was HSV who equalised against the run of play five minutes after the restart. Rafael van der Vaart’s free-kick found an unmarked Westermann, who headed home from close range. The hosts were undeterred by Hamburg’s leveller, however, and retook the lead half way through the second half when Adler failed to keep out Aubameyang’s powerful effort. Hamburg seemed to cave in after that third Dortmund goal and the Yellow-Blacks wasted no time in putting the match to bed. Reus’ dummy let Aubameyang’s cross through to Robert Lewandowski, who took a touch before placing the ball into the bottom right corner. It was Reus’ turn to get in on the act next. The German international was put through on goal and took his time before finding the same corner of the net as Lewandowski. The Polish international completed the rout nine minutes from time when he headed home inside the penalty area. The victory was no less than Dortmund deserved and quite rightly keeps them top of the Bundesliga summit.